“This one’s for John!” Denver Broncos owner Pat Bowlen belted out to the world on the evening of January 25, 1998, after franchise quarterback John Elway led the team to their first Lombardi Trophy at Super Bowl 32 in San Diego, California. Today’s Throwback Thursday entry happened 20 years ago to the day, and it comes as no surprise that one of the greatest and most defining sports moments ever gets the nod. I still get goosebumps and hyped up every time I see the video of the “Helicopter Play”, so I can only imagine what this display of heart did for the guys lining up alongside #7. As a competitor, this is pure six to midnight gold here, ladies and gentlemen. Photo credit Pioneer Press. You see, Super Bowl 32 was not Elway’s first rodeo. “The Duke” was making the fourth Super Bowl appearance of his career after falling short in his first three trips. The grit and determination on Elway’s face on the 3rd down play to move the chains in the Red Zone is nearly unparalleled. His menacing blue eyes nearly pop out of his face mask as he scrambled for what NFL Films has called the “greatest 8-yard run in Super Bowl history”. John Elway dives for first down in Super Bowl 32. Photo credit Google. 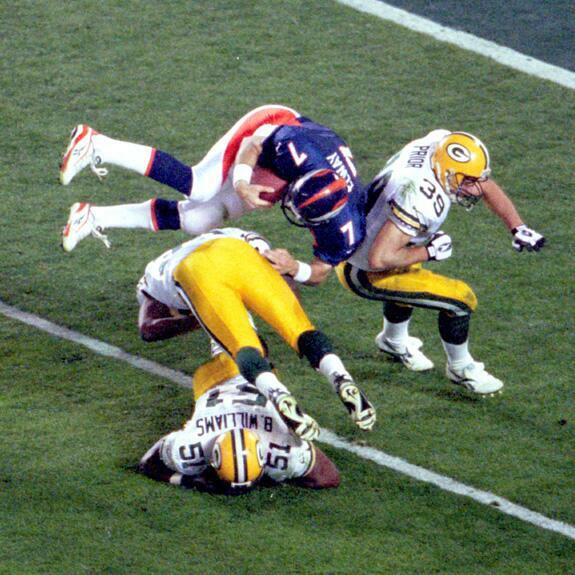 The “Helicopter Play” sent the message to the world that Elway was not going to be denied glory a fourth time. The 37-year-old wanted it more than anyone else on the field and he was able to rally his troops to victory over the Green Bay Packers. Many former Broncos from this championship team have been on record saying that there was no way they could not sell out one hundred percent on every play after seeing that Elway was literally willing to throw himself face-first into a clash with defenders just to get a first down. While watching and following the Senior Bowl down in Mobile, Ala., “The Duke” John Elway’s presence has drawn no shortage of attention. Elway, now Executive Vice President of Football Operations and General Manager of the Denver Broncos, has been seen evaluating talent firsthand while his Broncos coaching staff directs the action for some of the most elite college football seniors. John Elway at a Senior Bowl practice in Mobile, Ala. Photo credit 104.3 The Fan. As I watch “The Duke” pace the gridiron looking for what may be the next quarterback for the Denver Broncos, I cannot help but wonder if any of the players he is scouting have the one thing he had that could not be measured or put to paper. Yes, John Elway had the rocket arm. Yes, John Elway had the mobility. Yes, John Elway had the Stanford-level intelligence and checked all the boxes. But above all else, John Elway had something beating in his doggone chest that was not going to be silenced on that 1998 night. John Elway had heart. -Jordan Kurtz AKA Kurtzy F is a founding member of Comments From The Peanut Gallery.